Here at “Misty Morning Cottages” we may receive monetary compensation via various affiliates. Should you choose to visit their site(s) via our links, we may be compensated for a portion of the sale. Any ads you click that are from third parties may be placing and reading cookies on your users’ browsers, or using web beacons to collect information. Misty Morning Cottages utilizes Mad Mimi for RSS/Email subscription. This is a service that is provided only for those that request to receive our mailings. We will not sell your email to a 3rd party or use it in any way other than to contact you as a MMC subscriber. Joe, Misty, Joey, Daniel and Amber are your hosts at Misty Morning Cottages (formerly Sundown Cabins) in Rockwood, Maine. 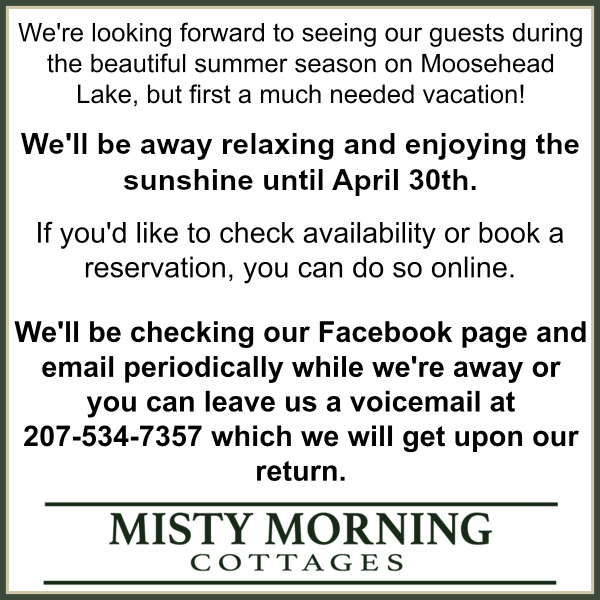 We look forward to being part of your Moosehead adventures!